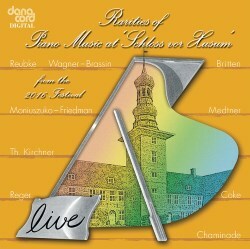 It is always a great pleasure to review the annual Danacord CD “Rarities of Piano Music at Schloss vor Husum”. Listeners must remember that this disc is a judicious and eclectic (but necessarily small) selection of pieces and performers from a wide range of recitals, presented over the eight-day festival period in the beautiful Schleswig-Holstein region of Germany. The 2016 Recital Opens with Cécile Chaminade’s Les Sylvains, an elegant evocation of the Fauns of Greek mythology. Two themes balance each other: a wistful, romantic tune and a livelier passage depicting the vivacious manoeuvres of woodland sprites. I understand that Johann Blanchard plays the “difficult” version, as opposed to a simplified arrangement for tyros. The pianist with most “hits” on the present disc is Severin von Eckardstein. He opens his selection with the vibrant, but occasionally melancholy, Barcarolle, no. 8, op. 96 by Gabriel Fauré. This is followed by a Prelude by Robert Casadesus: this music is sultry and quite introverted. Anatoly Alexandrov managed to create a synthesis of romantic Russian composers such as Scriabin and Medtner. The complex Vision, op. 21 no. 2 (c. 1923), written in six flats, weaves its magic spell with flexible time signatures and imaginative pianistic figurations. Organ enthusiasts will know of Julius Reubke’s massive Sonata on the 94th Psalm in C minor, one of the repertoire’s master works. Less well-known is the Piano Sonata in B flat and the present Scherzo in D minor. The latter is a technically demanding piece that does not quite live up to the complexities of the organ sonata. Severin von Eckardstein’s final selection is an arrangement by Louis Brassin of the Magic Fire Music from Richard Wagner’s The Valkyrie. This is an effective, if somewhat brash, transcription. It deserves an occasional outing. I loved Zlata Chochieva’s performance of Franz Liszt’s Hymne de la nuit, the second of his Harmonies poétiques (1847). This is a multifaceted, technically challenging number that creates its magic by musically nodding to (but never parodying) Beethoven’s “Moonlight” Sonata and Chopin’s nocturnes. It is a beautiful, romantically charged piece that deserves to be better known. Chochieva’s second piece is Nikolai Medtner’s equally beautiful Canzona serenata, op. 38 no. 6 dating from just after the Great War. It is hard to understand the “serenity” of this piece conceived in the aftermath of such horrific and tragic events. On the other hand, the middle section is a little more animated, but never troubled. Martin Jones plays Sergei Rachmaninov’s two lovely “early” songs, transcribed by the legendary American pianist Earl Wild. Wild takes these pieces and quite deliberately goes over the top. He out-Rachmaninovs Rachmaninov in every way, although the music never loses sight of the original setting. I have never heard (consciously) either Stanislaw Moniuszko’s Printemps, op. 28, no. 1 as arranged by Ignaz Friedman, or Ignaz Paderewski’s Nocturne, op. 16, no. 4. The first piece is a creative transcription of a song, whereas the charming Nocturne is less profound than the genre may imply. Hubert Rutkowski plays both works with imagination and intuition. A surprise for me were the Nachtbilder (Night Scenes), op. 26, nos. 2 and 6 by the German composer Theodor Kirchner. I guess that I associate him with relatively easy music contained in various albums of “teaching” pieces. It was great to hear these highly charged romantic works by a composer who was friendly with Mendelssohn, Schumann and Brahms. Florian Noack gave an inspired performance that should encourage listeners to seek out more of Kirchner’s music. Max Reger is often seen as dry as dust: a composer of monolithic works for organ which are longwinded, overly chromatic and often downright boring. The present little piece for piano, Träume am Kamin, op. 143 no. 12 Larghetto (Studie) blows away this image in less than three minutes. Here is a well-judged “lullaby”, easy on the ear and evoking “Dreams by the Fireside”. What could be more childlike and simple than that? Joseph Moog brings innocence and charm to this diminutive study. Moog’s other piece here is Domenico Scarlatti’s Pastorale arranged by Carl Tausig. The liner notes point out that duo Andreas Grau and Götz Schumacher concentrated (in their recital) on Ferruccio Busoni’s arrangements and compositions inspired by Bach and Mozart. Their big number was the 40-minute Fantasia contrappuntistica, played from memory. As an encore, they gave the present fine performance of Busoni’s arrangement of Mozart’s The Magic Flute overture. Johannes Brahms is represented on this CD with his restrained Hungarian Dance No. 11 (four hands) played by Cyprien Katsaris and Hélène Mercier. Although an accomplished pianist, Benjamin Britten was not noted for writing piano solo music. There are a few pieces, the best known of which is probably the present Holiday Diary. Artem Yasynskyy plays the second and third movements here: the meditative Sailing and the vibrant, toccata-like Funfair. These pieces were clearly inspired by the composer’s youthful visits to the East Anglian seaside resorts. Roger Sacheverell Coke’s Prelude op. 33, no. 7 was composed just prior to the outbreak of the Second World War. Coke’s then-unpopular, late-romantic style meant that his work never gained traction. Something similar happened to the music of York Bowen. In our more diverse days, we can enjoy a composer’s achievements without getting too hung up about labels. Simon Callaghan, who has issued a CD of Coke’s music on the Somm Label (SOMMCD 0147), includes the sets of Preludes op. 33 and op. 34. The programme on this disc closed with Callaghan’s rendition of My Favourite Things from the Sound of Music, in Stephen Hough’s stimulating arrangement. This is exactly the sort of number I would expect to hear on Classic FM. It appeals to the classicist and the music show enthusiast. It is an absolute delight. There is so much of interest on this CD that it is impossible to pick out highlights: in fact, it is a delight from end to end. Not only is the programme presented on this disc imaginative and inspiring, but the playing by the galaxy of soloists is masterful. Add to this Danacord’s usual high quality of recording (live performances) and the informative liner notes. The result is a CD quite simply to luxuriate in.